Facet joint syndrome is a pathological condition wherein the spinal apophyseal joints are deemed to be the root origin of back or neck pain complaints. The condition is alternately called facet syndrome, but may also be diagnosed as facet arthropathy, facet arthrosis or facet disease. Facet syndrome is a diagnosis on the rise and most often affects patients in the middle to lower cervical spinal vertebral levels or the lower lumbar vertebral levels of the backbone. Facet syndrome can be difficult for some patients to understand, since there are several distinct ways in which the facet joints can create pain. Each mechanism is completely different and often involves case-specific treatment paths. Furthermore, the very concept of facet joint degeneration is mostly misunderstood, making it difficult for patients to truly ascertain the accuracy of their diagnosis. This resource section examines the occurrence of facet syndrome in the human spine. We will provide detailed discussions on related topics including the locations of facet disease and the various diagnostic nomenclatures that are used to identify the various forms of the condition. 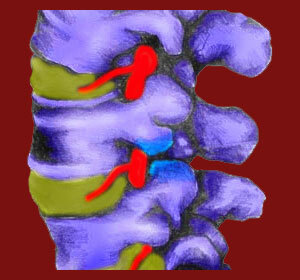 Cervical facet joint syndrome is a very common variety of spinal joint degeneration. The middle to low cervical levels of the spine are the most often affected, although cervical facet joint pain can occur at any level of the neck, including the uppermost vertebrae in some patients. Cervical facet syndrome is generally exacerbated by movement of the head and neck. In some cases, extension or flexion of the neck might be symptomatic escalating actions, while in others, rotation of the neck might increase pain. Many patients suffer discomfort upon any movement of the neck. Thoracic facet joint syndrome is the least often demonstrated type of spinal joint deterioration. The thoracic spinal joints are not called upon to bend and flex as much or as often as the other regions of the backbone. The thoracic vertebrae are also reinforced by bones and soft tissues from the ribs, increasing their strength and resistance to both injury and age-related changes. When facet joint pain is diagnosed in the upper back or middle back areas, it is generally found near the frontiers of the cervical or lumbar region. Some patients demonstrate cervico-thoracic facet syndrome, while others demonstrate thoracic-lumbar facet syndrome at the junctures of the cervical and thoracic, and thoracic and lumbar regions respectively. Lumbar facet joint syndrome is also very common, since the lumbar spine is forced to constantly bend and flex in order to provide us with the functionality our bodies demand. Additionally, the lumbar spine supports the majority of our body weight and suffers more dramatic degeneration than the other regions for this reason, among others. Lumbar facet syndrome is most often displayed at L4 and L5 levels, but is not uncommon at the higher lumbar levels, as well. Below, we provide some discussions relating to various manifestations of facet syndrome and the diagnostic terms used by physicians. New content will be added in this section as it is published. These dissertations will help broaden your understanding of all things related to facet joint syndrome. Facet joint arthritis is a proper diagnostic term used to describe the age-related changes in the zygapophyseal joints. Facet arthritis is normal to experience and is not inherently painful or pathological. Facet joint arthrosis, also called facet joint arthropathy, denotes painful arthritic accumulations in the apophyseal joints. Remember that many cases of facet syndrome are mistakenly diagnosed, so it is always wise to get more than one medical opinion to verify the facet syndrome diagnosis prior to undergoing any type of treatment. Facet disease is a ridiculous diagnostic term that follows in the footsteps of the laughably named degenerative disc disease. No form of facet syndrome qualifies as a disease. This nomenclature is used to exacerbate the already considerable nocebo effect of the facet syndrome diagnosis and should be discouraged from utilization by any medical professional or complementary healthcare provider. Painful facet joints might come from any of the several distinct causes of facet syndrome. Localized pain is consistent with most forms of facet joint arthritis, but may also come from other related events, such as a compressive neuropathy of a nerve root. Do You Understand Facet Joint Syndrome? We hope that this introduction to facet syndrome helps you to understand the basic and most relevant facts of the condition. To summarize, facet syndrome is the name of the diagnosis wherein pain is deemed to originate from the spinal apophyseal joints. In order to qualify as true facet joint arthrosis, the symptoms should be able to be resolved by treating the facet joint itself with some form of curative intervention. For additional information about facet joint pain, we recommend reading more about the causes and symptoms of facet syndrome to deepen your understanding of the diagnosis. You can also read through our complete facet joint syndrome resource section at The Back Pain Authority website. Do you need help with painful facet syndrome? We can help. Our proven pain relief program is available around the clock for immediate assistance.